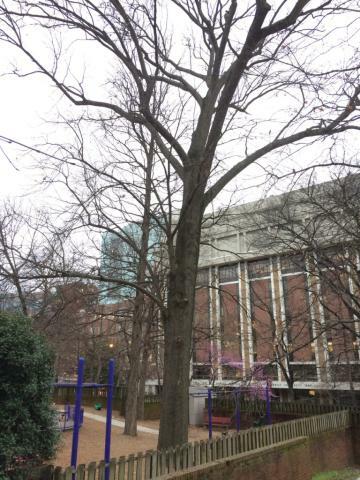 This tree is just inside the Susan Gray Playground. A distinctive feature of pin oak is its leaves, which have a small number of narrow lobes that stick straight out from the centerline of the leaf. In their native habitat, pin oaks are wetland trees. However, they do well in cities and are therefore frequently planted as street trees. This particular tree is one of the largest pin oaks in the arboretum. This organism is a living specimen that is part of the  Vanderbilt University Arboretum  with the local identifier 1-483. Location determined from GIS database.